Alright kids, it’s February, which means that we’re only a few short weeks out from March Madness – and I’m not talking about basketball. Spring is fast approaching in the northern hemisphere, and with it comes the massive, city-wide, ten-day feeding frenzy of music and culture that is Austin’s South By Southwest (SXSW) festival. Running this year from March 13-22, the festival is truly a one-of-a-kind experience, featuring speakers, films, new technology and musical acts from all over the world. 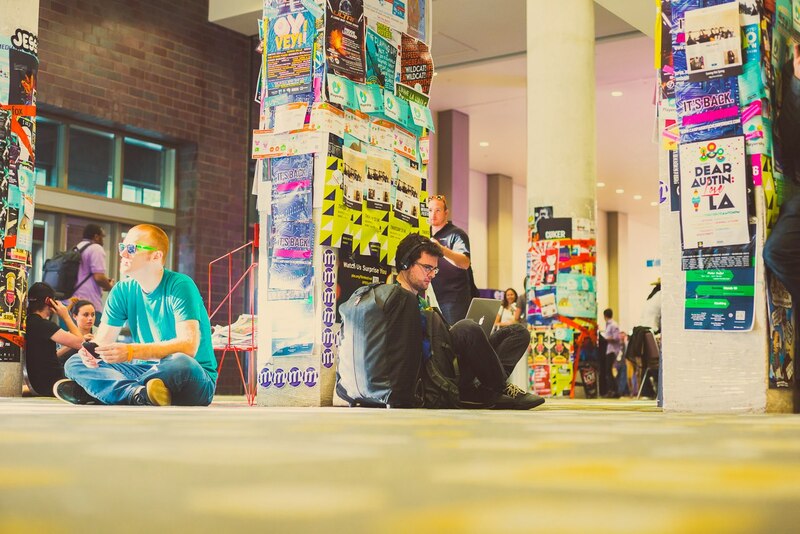 SXSW is an amazing platform for industry leaders sharing ideas, artists connecting with new fanbases, and attendees simply drinking it all in while enjoying the sights and sounds the self-proclaimed “live music capital of the world” has to offer. SXSW is beautiful and hectic, and while it will almost certainly end up being the most fun you’ve ever had, it’s also not for the faint of heart. So whether you’re a South-by veteran or a first-timer, keep these local-approved tips and tricks in your festival toolbox (preferably a hands-free bumbag, or “fanny pack” as Americans call it) and rest easy knowing you’re prepared for the best ten days of your life. I mean, you can, if you have thousands of dollars in disposable cash to splash. More power to you. But for the rest of us, it’s simply not feasible to spend almost $1000AUD on a Music Badge, or $2085AUD on an all-access Platinum Badge. Many SXSW novices, especially foreigners, assume that like most other festivals, you need a ticket to attend, but this is simply not the case. It’s true that festival-goers wanting to attend “official” SXSW events (such as film screenings and panels, or anything on the Interactive program) will need a badge or wristband, but over the years SXSW has grown into a truly city-wide phenomena that features hundreds upon hundreds of unofficial events that are often more fun and better-attended than what’s on the official bill. Over the course of the festival, every single bar, nightclub, hotel, warehouse, empty parking lot and alleyway within the Austin city limits will host back-to-back gigs, parties and networking events, so never fear – even without a badge, you will never be short of something new to do, see or try. Better yet, you can eat, drink and be merry all week either for free or very cheaply, if you are organised and don’t mind waiting in a few lines (we’ll get to the details in a minute). If you have your heart set on attending events which require a badge, but don’t have the money to buy one outright, consider being a volunteer. Volunteering for SXSW on either a conference crew or production crew can be stressful and time-consuming, but you stand to earn perks such as Music or Platinum badges after working a certain number of hours (typically 80 hours, or between three and five shifts for a Music badge). Head over the the SXSW website to learn more. Almost every single unofficial party, event or multi-day function will require an RSVP prior to entry, so it is absolutely in your best interests to research which gigs you think you’ll want to attend ahead of time and RSVP online. If you find yourself totally overwhelmed by the sheer amount of information available, it might be worth using a bit of the money you didn’t spend buying a badge on a service that will automatically RSVP to hundreds of events in your name. It’s a sad truth that luddites and people who are perpetually losing their phones find it hard to hack it at SXSW (see above). Badge or no badge, if you are planning on being out and about all day and partying well into the night, it will behoove you to make sure that your smartphone/other internet-capable devices are charged and ready. After all that Tweeting, your phone will absolutely die at some crucial juncture – usually when you are desperately trying to RSVP your way into the Fader Fort – so make sure that you at least carry a charger with you, or an external battery pack if you’re feeling fancy. SXSW runs for ten days, so feel free to ease into it. Besides, most attendees (yourself included, probably) are mainly interested in the music portion, which this year doesn’t start until March 17. Plan to spend the Monday and Tuesday of music week getting your ducks in a row and jetting around town picking up assorted badges and wristbands ahead of the popular multi-day events like the Fader Fort, Hype Hotel and VICELAND. Another crucial element of making your week run smoothly will be to make sure that for every time-slot you’ve filled, have three or four alternate events on your radar. The crowds at South-by can be huge and unpredictable – at least once, you will show up early to a show you have been looking forward to for days, only to find that everyone else has had the same idea and you are now at the back of an 800-person line. When this inevitably happens, it helps to have a few consolation gigs on the backburner. Plus, you could end up discovering your new favourite band! Nearly 150,000 people have attended SXSW in recent years, and 100,000 of them are out-of-towners, so to avoid feeling overwhelmed try stepping slightly off the beaten path. Save on flights by arriving well ahead of the festivities, and try to find accommodation through AirBnB, Craigslist or even couchsurfing rather than paying inflated prices for a hotel room. Austin is also home to a thriving student co-operative community, and many co-ops are happy to host travellers (just make sure you contact them in advance) for as little as $15 a night. Austin is a beautiful, bustling city with loads of history, character and outrageously tasty food to boot, so to combat burnout, spend a day tooling around the city, visiting the Bullock Texas State History Museum, chilling hard by the Greenbelt, or sampling brisket at one of the many, many legendary BBQ joints. Rent a bike using the B-Cycle bikeshare program (handy because the CBD is almost entirely closed to car traffic during the festival) and breeze from one venue to another while everyone else tries to hail an Uber or figure out the nonexistent public transportation. Finally, relax! You’re going to have a sick one. Check out Qantas flights to the US here.